[Photo] Jambu Fruit-dove (Ptilinopus jambu). Photo by Ltshears. License: public domain. The Jambu Fruit-dove, (Ptilinopus jambu) is a smallish colourful fruit-dove. It is a resident breeding species in southern Thailand, Malaysia, Brunei and the Indonesian islands of Kalimantan, Sumatra and Java. The Jambu Fruit-dove inhabits mangrove swamps and lowland rainforests up to 1,500 m and is also found in second growth woodland. The male holds a breeding territory, advertised by raising its wings, bobbing its body and cooing. It will defend its territory with a quick peck if the territorial display fails. The female builds a flimsy nest of twigs, roots and grasses, which are collected by her mate, in a tree and lays one or sometimes two white eggs which are incubated for about 20 days to hatching, with a further 12 or more days to fledging. The Jambu Fruit-dove is 23-27 cm long and weighs about 42 g. It is a plump small-headed bird with soft feathers and very distinctive colouring including a white eye ring, orange bill and red legs. The call is a soft, low coo. 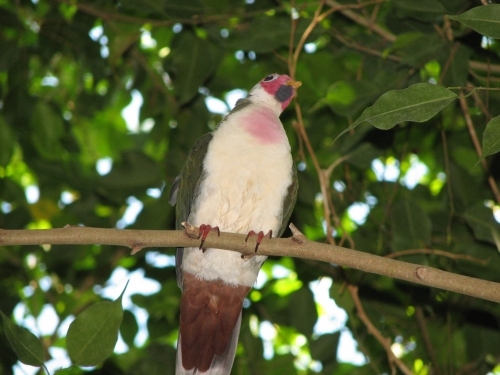 The adult male has a crimson face with a black chin, unmarked green upperparts and white underparts, with a pink patch on the breast and a chocolate brown undertail. The female differs from the male in that she has a dull purple face with a dark chin. The underparts are green with a white belly and cinnamon undertail. The immature Jambu Fruit-dove resembles the female but has a green face. The young male acquires its full adult plumage in about 39 weeks from fledging. The Jambu Fruit-dove is a shy and inconspicuous bird, camouflaged against the forest canopy by its green plumage. It is usually seen alone or in pairs, but a sizable flock may gather when feeding at a fruit tree. It eats fruit directly from the tree, or from the ground if items have been dropped by hornbills or monkeys. Like other doves, but unlike most birds, it can drink by sucking. Extensive deforestation in Indonesia and Malaysia means that this dove is now threatened, although its ability to live in second growth and at higher elevation means that its situation is not as critical as that of some forest bird species. The Jambu Fruit-dove is evaluated as Near Threatened on the IUCN Red List of Threatened Species. The text in this page is based on the copyrighted Wikipedia article shown in above URL. It is used under the GNU Free Documentation License. You may redistribute it, verbatim or modified, providing that you comply with the terms of the GFDL.